We (or more technically, I) have been living at the condo for a good solid few months now. There has definitely been some progress in terms of decorating. It's been a while since I've showed you the inside of our condo! It's looking a little different now than it did when we first moved in. The first thing that got an upgrade was the couch. I had a green sofa with a pull out bed from when I first moved to Memphis. It looked so small in our amazing living room. 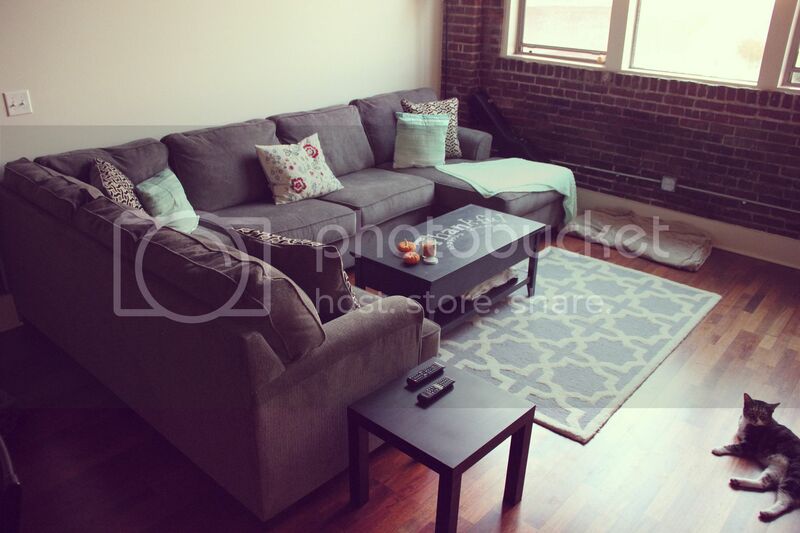 We knew we wanted a sectional to accommodate lots of friends and lots of Sunday afternoon naps. 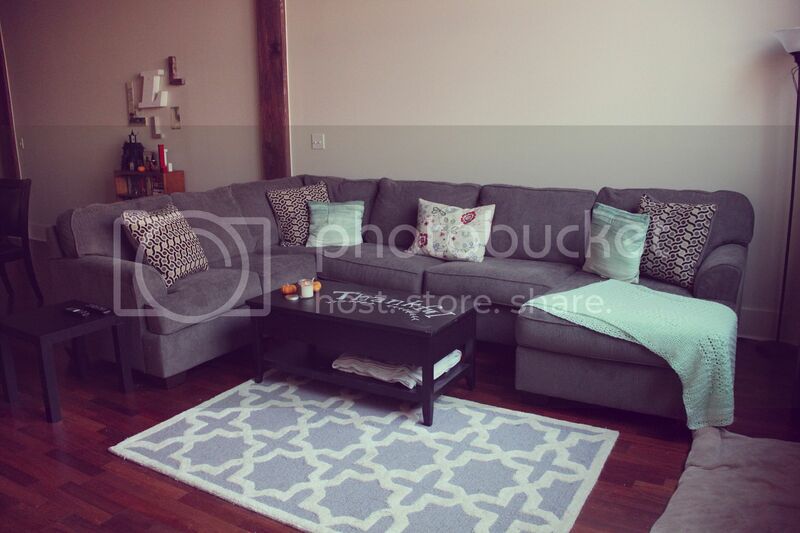 One day, while out browsing, we found the perfect sectional! Honestly, I thought it would be hard for us to find something that we both liked. We were in the store for all of ten minutes and we knew this couch was ours. Since it's been delivered we both have claimed our sides of the couch. This has very quickly become my favorite part of our condo. PS. You can see the our growing "L" collection in the background!! Love the couch and colors! The table is awesome!!! This is the couch dreams are made of! I love it! Your condo is so cute!!! I LOVE your adorable coffee table. You've got an eye for design love! Love the updates! That couch is great and definitely love the coffee table. 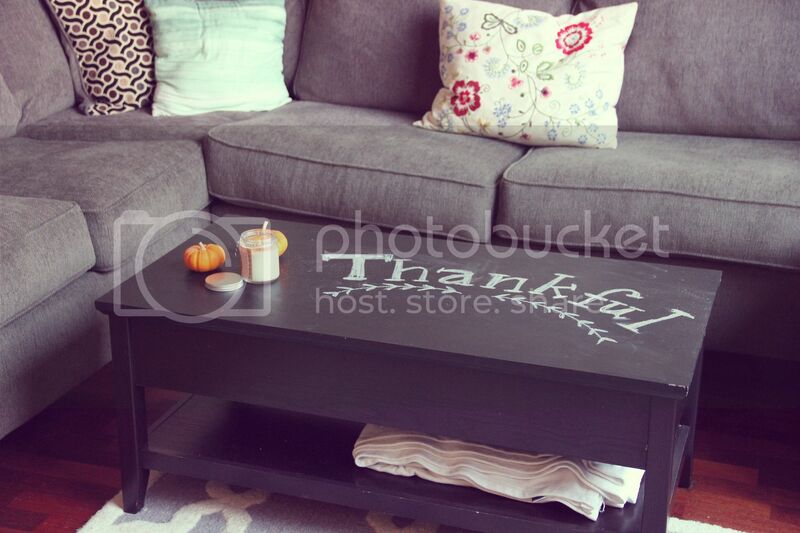 I am really wanting to paint one with chalkboard paint now. And check out Hobby Lobby. They have some new letters in. My daughter has a section of B's in her room and we just found one this weekend there that we haven't seen before.